Traditional Korean martial arts began to emerge during the Three Kingdoms period, i.e. more than two thousand years ago. However, taekwondo can’t boast of such a long history. Its formation began shortly after World War II, when new martial art schools called kwans opened in Seoul. Taekwondo is based on traditional Korean martial arts and incorporates elements of Chinese martial arts and karate. It is characterized by its emphasis on kicks. World Taekwondo officially designated September 4 as International Taekwondo Day at the General Assembly in Ho Chi Minh, Vietnam in 2006. Such a date was chosen because on this day in 1994 the International Olympic Committee officially adopted taekwondo as an Olympic discipline. It was contested as an official Olympic sport for the first time at the 2000 Summer Olympics in Sydney, Australia. 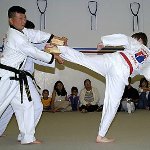 International Taekwondo Day is widely celebrated in South Korea and abroad. It is marked with competitions, demonstrations, concerts, and other events for martial artists and anyone interested in or fascinated by this martial art.